5th Dec 1844 - 18th Mar 1924.
from 1988 to 1991 when she was appointed Assistant Organist there. She also acted as Assistant Conductor of the Wellington Youth Choir and appeared as a soloist with Wellington Youth Orchestra. Katherine came to England in 1991 to take up the post of organ scholar at Winchester Cathedral and Assistant Organist at Winchester College. Ralph William Downes was born 16th August 1904 in Kensington, London. He studied at the Royal College of Music, London; Keble College, Oxford; Pius X School, New York City, U.S.A.
Clive Driskill-Smith was born in 1978 in London. Studied organ with Bengt Berg before entering the Royal College of Music, Stockholm, where he studied with Alf Linder. David Drury was born 1961 in New South Wales, Australia. He was educated at Trinity Grammar School, Sydney. In 1984 he graduated from the Sydney Conservatorium of Music with a B.Mus in organ performance and he was also the recipient of the “Vasanta” scholarship for overseas study. , and gained the Associate Diploma in organ, and the Choir-Master Diploma from the Royal College of Organists. He was formerly organist at St James Church, King Street, and has given recitals in Westminster Abbey, St Paul’s and Westminster cathedrals in London, King's College, Cambridge and Notre Dame and La Madeleine in Paris. since January 1996 and was also Master of Music from 1996-2007.
. He continued studying with David Sanger as a postgraduate at the Royal Academy of Music and also spent a year as Organist of Marylebone Parish Church. He worked in the United States as Director of Chapel Music and Staff Accompanist at the College of Wooster, Ohio, before becoming Assistant Director of Music at Uppingham School. in November 1991 and subsequently performed with Winchester Cathedral Choir in concerts, broadcasts, recordings and tours to Brazil, USA and Australia. He assisted David Hill with the Waynflete Singers, taught at Southampton University and is a previous conductor of the Southampton University Chamber Choir and Winchester Music Club. Tabernacle Organist Tabernacle Organist Rick Elliot discusses how a shoulder injury led to a musical breakthrough. Richard Elliott was born in Baltimore, Maryland, and is a convert to The Church of Jesus Christ of Latter-day Saints. Before his baptism, he had studied organ at the Peabody Conservatory and the Catholic University of America. He earned his bachelor of music degree from the Curtis Institute in Philadelphia and his master's and doctoral degrees from the Eastman School of Music in Rochester, New York. He became an assistant professor of organ at Brigham Young University. He was appointed as Tabernacle organist in 1991. He plays the 11,623 pipe organ in the Tabernacle and the 7,667 wind-powered pipes of the Conference Center organ. He is also a former assistant organist for Philadelphia's famed Wanamaker organ. Elliott loved music as a child and loved to listen to his mother play the piano. As a teenager, he played the organ in a rock band, which included flaming speakers, smoke machines, and flash pots that caused the group to be blacklisted because of the fire hazard. He learned to love gospel music at the church he attended with his family. His background brought a unique voice to his job with the choir. In 2009, the tendon of his left bicep ruptured and he had two options: leave it to heal and regain mobility, which would lessen the strength in his arm, or undergo surgery to repair it, which might cause nerve damage. He chose surgery and while recovering, he focused on practicing on the organ's pedal keyboard. That effort has led him to be especially skilled on the pedal keyboard and he often uses his skill in organ solos. Martin Ellis began organ studies in the 6th grade, and at 15 began studying with Gary Deavel at Manchester University in North Manchester, Indiana. At DePauw University in Greencastle, Ellis majored in keyboard performance and composition. The Central Indiana Chapter of the American Theatre Organ Society (ATOS) was extremely supportive, engaging Martin in performances regionally throughout his college years. Ellis was also head accompanist for the DePauw Choirs, touring to Carnegie Hall and Williamsburg, Virginia. He was active as a vocal coach to the voice department and assistant conductor for three opera/musical theatre productions produced by the DePauw School of Music. He graduated from Depauw in 1990. Before accepting the position playing for Rose City Park Presbyterian in 2014, Martin was Assistant Organist/Choirmaster at Second Presbyterian Church (Indiana's largest church) under Robert Shepfer, playing the 4m/81r Aeolian-Skinner pipe organ from 1990-1998. He then moved to Portland, Oregon, serving as Music Director/Organist at St. James Lutheran Church in downtown Portland. In 2004, Martin was appointed the Assistant Director of Music and Organist at North United Methodist Church in Indianapolis, playing the restored 4m/76r Kimball orchestral pipe organ and two other organs. Ellis' initial exposure to the theatre organ occurred at the Paramount Music Palace in Indianapolis when he was 7 years old. During his senior year, he served as the weekend artist at Milwaukee's Piper Music Palace, as an alternate organist at the Pipes and Pizza in Lansing, Illinois, and performed concerts in and around the Chicago area. Ellis is now an active featured theatre organist for ATOS and has been a regular theatre organ soloist in both the Chicago and Indianapolis areas for the last twenty years. After his move to Portland, Theatre organ came into play again as he served as an associate organist at Uncle Milt's Pipe Organ Pizza in Vancouver, Washington and played for the local organ clubs. He has appeared on the Ohio Theatre's summer movie series for several years. Mr. Ellis has been a featured artist at conventions of The American Guild of Organists, The Organ Historical Society, and The American Theatre Organ Society. Robert Hall Elmore was born on January 2nd 1913 in Ramaputnam, India. The family returned to the United States in 1915. They settled in Lincoln, Nebraska in 1918, where young Bob Elmore began piano study at age 6 and organ study at age 9. He wrote his first composition "Ozma Waltz" at age eleven. In 1925 the family moved to Wayne, Pennsylvania. 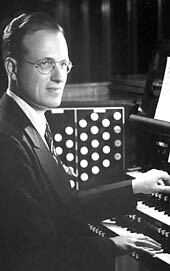 Young Bob Elmore studied organ, piano and music theory with the famed Pietro Yon, organist of St. Patrick's Cathedral in New York City. In the summer of 1933 Robert Elmore earned three licentiates simultaneously from the Royal Academy of Music on London in organ, concert piano, and piano accompaniment and became an Associate on the Royal College of Organists. English conductor of Polish and Irish descent. gave the first major performance of an Elmore work, his tone poem 'Valley Forge-1777'. 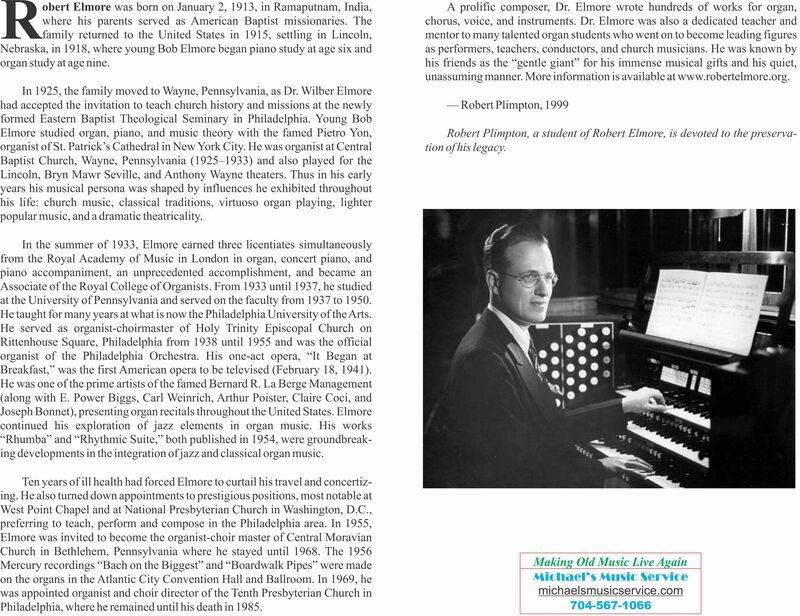 In 1955 Elmore was invited to become the organist-choir master of Central Moravian Church in Bethlehem, PA (1955-1968). The impact of the great Moravian music tradition on Elmore's creative work was immense. Ten years of ill health had forced Elmore to curtail his travel and concertizing. He also turned down appointments to prestigious positions, most notable at West Point Chapel and at National Presbyterian Church in Washington, D.C.
Robert Elomre died suddenly on September 22nd 1985. JS Bach Introduction to a research project featuring performances of JS Bach's organ works. Henry Fairs was born 1976 in in Hereford, England. Henry received his earliest musical education as a chorister at Leominster Priory and studied at the Birmingham Conservatoire, Conservatoire NDR Rueil-Malmaison and the Hochschule für Musik Köln, supported by an award from the Countess of Munster Trust. Studied the organ with Alan Spedding and Dame Gillian Weir. Studied at the Amsterdam Conservatory. Pupil of Anton van der Horst. in Copenhagen, and as a student was the recipient of grants from the Countess of Munster Musical Trust and the Worshipful Company of Musicians. In 1984 he became Organ Scholar of Clare College, Cambridge, where he obtained a double first in Music and a master's degree in Musicology. organ works In August of 2012, organist Jeremy Filsell made a landmark recording of his own transcriptions for organ of works by Sergei Rachmaninoff. Jeremy Filsell was born 10th April 1964. Having played piano and organ from a young age, he was a Limpus prize winner for the FRCO examination, which he took when he was 19, and Silver Medallist of the Worshipful Company of Musicians. B.A., M.A., Mus.B., A.R.C.M., C.B.E. He went on to study piano with David Parkhouse and Hilary McNamara at the Royal College of Music and Martin Hughes at the University of Surrey. He won second prize in the 1993 St. Albans International Organ Competition. A.R.C.O., F.R.C.O., Hon. A.R.C.M., F.R.C.M., C.B.E. , gaining his ARCM, FRCO and CHM diplomas and winning the Geoffrey Tankard Prize for Organ playing. In 1959 he became Organ Scholar at Christ Church, Oxford and studied with Dr Sydney Watson, Dr Bernard Rose and Dr H. Kennedy Andrews. During his student years he was Organist of St Mark’s, Regent’s Park in London. He became Assistant Organist of Hereford Cathedral in 1962, and Assistant Lecturer in Music at Hereford College of Education in 1963. During this period he studied the piano with Professor Claud Biggs and acted as an assistant chorus master, organ soloist, and accompanist for The Three Choirs Festival. Alexander Frey was born 5th October 1972 in Chicago, Illinois. Studied at the Eastman School of Music, Rochester, New York. He taught at the University of Michigan for over 40 years. He is a virtuoso organist and pianist and American symphony orchestra conductor. He first learned to play while at school in Crieff, having been evacuated from Glasgow during the Second World War. Back in Glasgow after the war, he continued to study the piano with "various top-notchers", and in 1964 moved to Belgium, where he took tuition from the famous organist Flor Peeters. Kelvingrove An organ that even virtuoso players find daunting. It is played from a balcony some 60 feet above the floor, and has nearly 3000 pipes, a small pedal board that necessitates pointed shoes to be worn and a nine-second echo because of the cavernous space in which it is located. Art Gallery and Museum three times a month. Over the years he played recitals at St Giles Cathedral in Edinburgh and Glasgow University Chapel. Two of his Christmas concerts at the Kelvingrove in 1964 and 1965 were also broadcast by the BBC. He had six pipe organs at home in Barrhead, kept in a converted double-garage known as the Organorium. Dr. Gerard Gillen is Professor Emeritus in Music at the National University of Ireland, Maynooth, having retired from the position of Professor and Head of the Music Department of that university at the end of September 2007. He came to NUI Maynooth in 1985, previously having been a lecturer in music for sixteen years at University College, Dublin. Professor Gillen has overseen the expansion of the Music Department in undergraduate and postgraduate programmes, for example, new diplomas in Music Technology and Church Music. He also directed the University Choral Society from October 1985 until April 2007. Prelude and Fugue in G Major Gottfried Silbermann organ of Freiberg Cathedral, Germany. David Goode was born in 1971. From 1996–2001, he was sub-organist at Christ Church, Oxford. From 2003 to 2005, he was the organist-in-residence at First Congregational Church in Los Angeles California. In 2005 he returned to Eton College. George Howell Guest was born 9th Feb 1924 in Bangor, Wales. He was a chorister at Bangor Cathedral and studied at Friars School, Bangor. Studied at Loretto School; the Royal College of Music, London, under Sir Walter G. Alcock and Arthur Benjamin; Pembroke College, Cambridge, under E. J. Dent; in Sienna with Casella; in Paris with Nadia Boulanger. Organ scholar of Pembroke College, Cambridge; organist of St. John’s College, Cambridge. Organist of Connah’s Quay Parish Church; assistant organist of Chester Cathedral; organist of Christleton Parish Church; organ scholar of St. John’s College, Cambridge; organist St. John’s College, Cambridge. Lecturer at St. John’s Downing College; Queen’s College, Cambridge.